Mt Kearsarge. Washington wasn't enough disappointment. With bicycle hillclimb events going the way of road racing lately, I find it important to support the local events. Mt Kearsarge is one of these events, well organized, with modest entry fee. Many waited until the last week to sign up, so I worried it could be canceled. Before pre-reg closed, I was pleased to see numbers up from last year. I beat myself up during the week, maybe subconsciously paying penance for slacking off and abysmal performance on Mt Washington the weekend before. I have a big cycling/hiking trip coming up too. I can't rest the month of August for a couple hillclimb events when I'm looking at back-to-back 25-30hr weeks with copious climbing at altitude. Intervals Tuesday (what were those again? ), 32 minute run up Mt Monadnock Wednesday, then 2hr fairly rigorous MTB ride on new terrain the day before the race. Felt tired getting up, head not into pushing myself at all. I just wanted to stay in bed. But the weather was fabulous. I was thinking more about the short hike to the summit than the race. Sneakers were going up in the support vehicle. Warming up, my legs felt like poo. I wanted to get the bloodbath over with. We take off at 9:30am. Unlike last year, the young guns didn't go ballistic on that wall right near the start. Staying with the lead dozen guys or so was much more manageable. Erik V was in that group, who is in my 50-59 age group on Kearsarge but not 55-59 age group on Washington. He's untouchable. I didn't know if any others of the dozen were 50+ or not. Mark V, next age group older was with us. He handily beat me on Mt Washington the week before. I beat him on Kearsarge last year. The course is rolling uphill first four miles. There was a cash prime at the toll gate where the real climbing begins. The young guns went for that as I found my pace for the next mile of 12% grade. I put a very small gap on Mark but didn't expect that to hold. I was so deeply anaerobic. This short climb favors my C/C gene. The climb is over before you know, maybe only 20 minutes of real work. I can suffer with the best for that long. I didn't feel the temptation to capitulate like I did part way up Mt Washington a week earlier. I stuck with the program. The hounds were always right behind me, keeping me honest. If I had let up even the slightest, Mark and two others would have passed me in a instant. Optimal time-trial strategy in many situations is even splits. But so many go out too hard, hit deflection in the middle, recover some only to get a second wind towards the end. It is a classic bathtub curve function with a large, junky middle where many seconds are lost against the clock. I think I faded a little in the second half of the climb, but so did the three chasers right on my wheel. In the last few hundred meters, the hounds smelled blood and Watts seem to be miraculously produced holding them off. When I crossed the line, I think I was within three pedal strokes of puking. Yeah, it was that good. It was the same feeling and similar duration to when I PR'd running up Mt Monadnock a couple weeks ago. Love that stuff. The endorphin buzz can last for hours after. Anyway, that was good for 9th place overall, same as last year except more riders this year. Only a few seconds slower than last year, which may be attributed to a less aggressive lead-up to the climb. Nobody older than me beat me here, unlike on Washington last week. At least that's a metric I use to rationalize not sucking too badly. I quickly changed into my trail runners and headed up to the summit. I was blown away to find not another person up there. Have never had this summit 100% to myself. Sure, the auto road was closed for the race, but the north side has a popular hiking trail up to the summit too. On the descent, my front tire flatted just before the toll gate, 4mi from the starting area. Ugh! Not just me, but at least two other riders flatted there too. I didn't hit anything hard, don't think my rims got too hot. It was a slow leak, taking a while to go completely flat. What was on the road? Chris P came by with a bicycle version of fix-a-flat. He offered to let me try it. I was skeptical, but it worked. Thanks Chris! After awards, I found my rear tire had gone flat too. WTF. Haven't pulled the tires off yet to see what the failure mode was. Glad it didn't happen heading up. Hope this race keeps going. Increase in numbers this year is encouraging. Always great to see such a diverse group of riders show up for uphill bike races. Back when there was still snow on the ground, I registered for this event. My motivations were: it would fall on my 55th birthday, age grouping up, it would be an "easy" podium. This assumed, of course, that registering for the race would motivate me to get back into Hill Junkie training mode with lots of VOmax and LT work on the bike. None of this silly trekking through the woods BS! This could be my last chance to climb this Rock Pile as a local too. Don't want to go too much into it here, but Cathy and I are at an inflection point in our lives and thinking about new possibilities. So did registering for the race motivate me to train? Heck no! Every time I tried to get into a periodic structured routine of interval work like I used to do, it quickly fell apart. I started hiking in the mountains a couple years ago and it grew on me. Nearly half of my outdoor time is now spent on low to moderate intensity treks through the mountains. I use poles, primarily for going down. Hiking brings considerable balance to the body, meaning you bring so many more muscle groups into play than highly imbalanced cycling does. I like it mostly for getting away from people and cars, although many hikes require sucky drives. You definitely get more top of the world experiences hiking than you can cycling. So much more terrain to explore when ditching the bike. I have been out to Mt Monadnock to run up to the summit three times this summer. That is intensely aerobic, or anaerobic I should say. Perhaps that would help maintain some semblance of peak fitness on the bike, I hoped. Needless to say, as Rock Pile day arrived, I knew my finishing time was going to be less than stellar. I didn't really care and wasn't going to let it bother me. I did rest well all week and felt great warming up. The temp was mild but humidity was quite high. The weather was decidedly better than predicted just a day or two earlier, almost perfect even. There were some seriously fast guys called up to the line, like Phil Gaimon, who many may know. Lot of familiar faces in the elite top notch wave, many new faces too. The eardrum popping cannon goes off. I made certain I didn't go out too hard. The race starts around 1500ft elevation, and by 3000ft, it felt like I slid backwards through the entire top notch field. Hmmm, that never happened before. It was borderline oppressively humid out, but I did not sense thermal overload yet. I just didn't have the goods I normally do. By 4000ft, riders from the next age group wave started passing me. Hmmm, that doesn't usually happen either. I kinda threw in the towel at that point. Why kill myself for 12th place and many minutes slower than my previous finish? The climb became much more manageable then. One thing I realized is that the same gears you use when posting 65 minute finish aren't adequate when you slog up much slower. 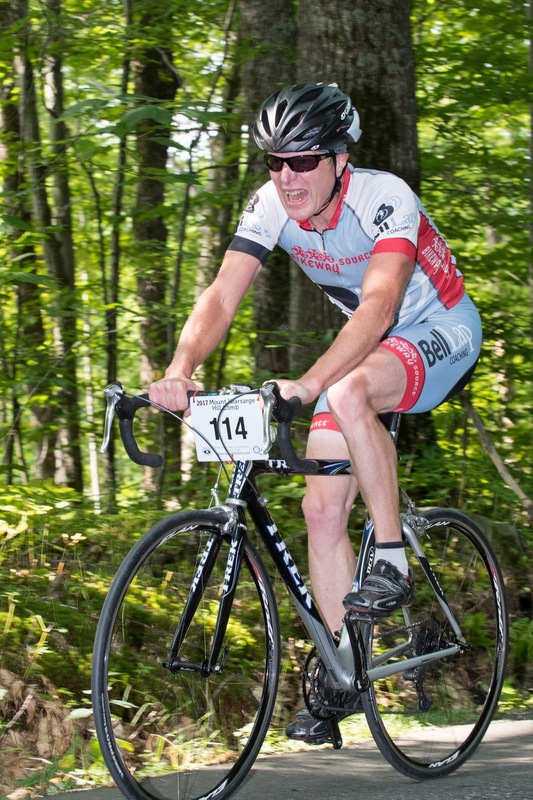 I was forced out of saddle in many places in my lowest gear just to keep the pedals turning. Oops. I have lower combinations to put on that bike, just didn't think it necessary. I've been using the same bike for this for about 16 years now, my Trek 5900. I reached a point in the climb where panic set in. What if I don't even make top notch time of 1:20? My pace was so far off that it was conceivable. I reached the finish in 1:14:55, my slowest ever, having to go all the way back to 2000, my first climb as a complete noob on inappropriately geared bike. Think I was still a bit heavier back then too. 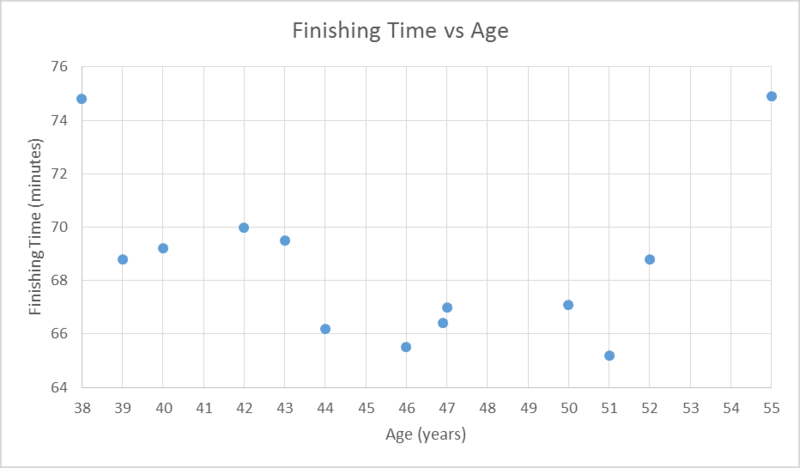 Below my 13 Mt Washington race result times are plotted vs. my age. First race was back in 2000, through today's race in 2017. Pretty amazing really, how consistent I was through all those years, posting my fastest just a few years ago at 51. In 2014 at 52, I commented in my training log about losing focus in training and it showed. That was nothing compared to this year! 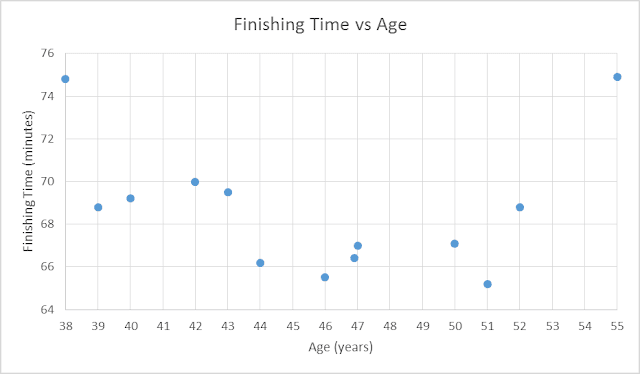 Age will eventually dictate a decline though. Maybe it starts mentally, not wanting to push that hard all the time. I think the only way I feel my age right now is it takes longer to recover from a long, hard weekend of activities. Add to this the six practice climbs I did over the years, I've ridden a bike up Mt Washington 19 times now. 90,000ft of climbing without rewarding descent! I've hiked it at least six times and ran up it last year for the foot race. That is at least 26 times self-powered up to the summit. I have never taken powered transportation to the summit. The summit was a party atmosphere as it always is for this event. The weather up top was spectacular, steady 7mph wind, high 50's, mostly sunny, and stunning cloud formations. A couple fast guys in my age group didn't show up, so back at the bottom I was shocked to see I still made the podium (2nd) with that finish. Normally you'd have to be much faster than 1:15 in 55+ age group to ensure a podium spot. Wish my friend Brett could have been there. He trained well for this race, would almost certainly have knocked me down a step. Unfortunately, he was diagnosed with anaplasmosis this week, a nasty tick borne disease. So many people are getting tick borne diseases this summer. Scary. The catered Hart's turkey lunch was awesome as always. Real mashed potatoes, squash, stuffing, carved turkey, couple kinds of salad, rolls and real butter, and ice cream. Overall a great day talking with great peeps. Many from Colorado come out for this event. Who knows, if I find myself in Colorado five years from now, maybe I'll come back on my 60th birthday. A lot of cars, but none of the overflow lots were used this year. Race did not sell out, first time since I've been doing this since 2000. Summit crowd will give you the boost to get up that 22% grade section! The Nelson Crag trail I hiked across the weekend before in zero visibility, frigid temps, 60-70mph wind. None of that today. Winds holding steady around 7mph. Warmest at 3300ft. Boott Spur on other side of Tuckerman Ravine. Hike over that last weekend too.